It is always nice to meet fellow Rotarian’s from around the world! Mellow and Janet Honek joined us at our weekly meeting. 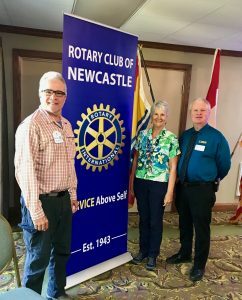 The couple, originally from Texas, are spending their Summer traveling the USA and Canada while taking in all things Rotary. Mellow belongs to the One World Rotary Club and Janet belongs to the Las Cruces Rio Grande group. Newcastle President Greg MacDiarmid is shown thanking Mellow and Janet for joining us. Safe travels! !